Insulating your hot water tank with a heater blanket (also called a 'jacket') is a cheap and simple means of improving your home's energy efficiency, saving you on monthly energy costs (Source). Many buyers say that it also improves the temperature of their hot water. Newer model hot water tanks are probably already insulated. If your hot water tank doesn't have an R-value of at least 24, you might want to consider purchasing a water heater blanket (Source). R-value refers to the the capacity of your insulating material to resist heat flow- this means that the higher the water heater's R-value, the greater its insulating power (Source). According to Energy.gov, hot water tank insulation can possibly reduce standby heat losses by 25%–45% and save you about 7%–16% in water heating costs a year (Source). Reviewers we spoke with advise to take careful measurements prior to purchasing a heater insulation jacket (check out the video below for specific advice). There are different insulation guidelines for electric and gas heaters- so ensure you properly install the blanket on the style of heater you have. Even though the insulation blanket may say (check the table below) that it will fit your heater, sometimes it doesn't completely wrap around, so you'll have to buy two blankets- so if you're in doubt, get two. As well, it sometimes make sense to have some white duct tape on hand if the blanket doesn't ship with enough. This water heater jacket offered by Thermwell is well-made, well-designed, and an excellent choice for insulation. Users love the easy installation process, but some do note that there was no tape included in the package. The Thermwell heater blanket measures 3” x 48” x 75”, and it features fiberglass and foil on both sides to ensure maximum insulation, a weight of 5.5 pounds, and foil tape for quick installation. The reflexive value of the Frost King blanket is 10, and it’s suitable for gas, oil or electric water heaters. It will fit water heaters up to 60-gallons. A buyer comments that he didn’t have any issues installing the blanket around a 50-gallon tank and that the provided tape was enough to secure it in place. Another happy customer states that he is very pleased with the quality and performance of the insulating heater blanket and that he recommends it. He adds that the installation instructions are easy to follow and that you should wear protective gloves when you install the blanket to avoid irritating your hands. A user comments that it fits perfectly around his tank and that he had some length left. 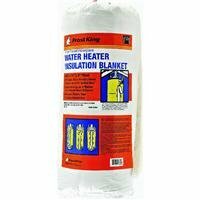 However, some customers have complained that the Frost King water heater blanket doesn’t fit even a 40-gallon tank and that there is not enough tape included. Some reviewers also note that the blanket they received didn’t match the provided specification. 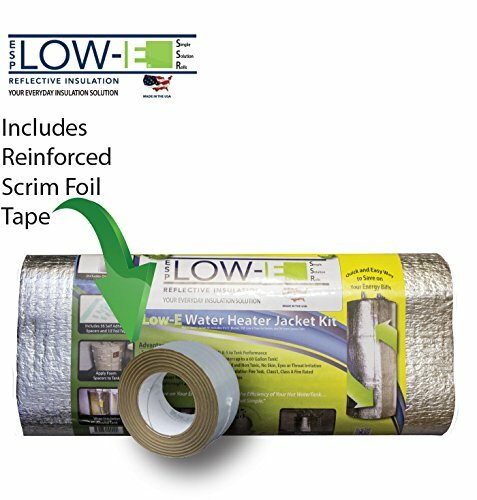 If you are searching for a way to save off your water heating bill, you might take a look at this insulation blanket offered by Low-E SSR. Users love the quality of the blanket and that it’s made in the USA, but some do note that the material should be thicker. This water heater insulation blanket features 1/8” closed cell foam and pure aluminum design, an E-value of 0.3, aluminum foil seam tape, and self-adhered foam spacers. It adds up to R-5 to your tank, and it’s suitable for water, gas, electric hot water tanks up to 80 gallons. The SSR kit is non-toxic, mold and mildew resistant, and it passes the Californian standards. A customer shares that this is the easiest to install insulating blanket that he has ever encountered and that he is very satisfied with the achieved results. He highly recommends it as the best heater insulation kit. Another happy buyer states that his electric bill dropped after he installed the SSR kit and that the blanket arrived fast and in perfect condition. A reviewer adds that he has an old heater, but he doesn’t have any problems with the insulation kit. Moreover, he is very satisfied with its functionality. However, a customer has complained that the blanket didn’t manage to fit his 80-gallon tank and that additional material should have been included. A buyer also notes that he didn’t notice any difference in his electric bill after installing the SSR kit. This heater insulation blanket offered by M-D Building is efficient, easy to install, and a product of high-quality and design. Users love that the installation instructions are clear and easy to follow, but some do note that the included tape might not be enough. This insulation blanket measures 48” x 75”, and it features an insulating value of R-6.7, a weight of 8.8 ounces, a vinyl-backed fiberglass design, and adhesive tape for quick attachment. The M-D heater blanket is 2-inch thick, and it’s suitable for oil, gas and electric heaters up to 60 gallons. In general, customers have a high opinion regarding this hot water insulation blanket, and they praise its design, functionality, and usefulness. A user mentions that the insulating blanket fits his 40-gallon tank perfectly and that it didn’t take him much time to install it. He adds that it’s better to buy two if you plan on wrapping a 60-gallon heater. A reviewer shares that the provided tape is of excellent quality and that it secures the blanket tightly. He highly recommends it. However, some customers have complained that the fiberglass is poorly woven and that it doesn’t work as well as he expected. Some other users also note that the blanket doesn’t fit a 50-gallon tank and that there is no change in their electric bill. If you are looking for an efficient insulating material, you might take a look at this water heater blanket offered by Duck. Users love the quality and the price, but some do note that it’s smaller than they expected. 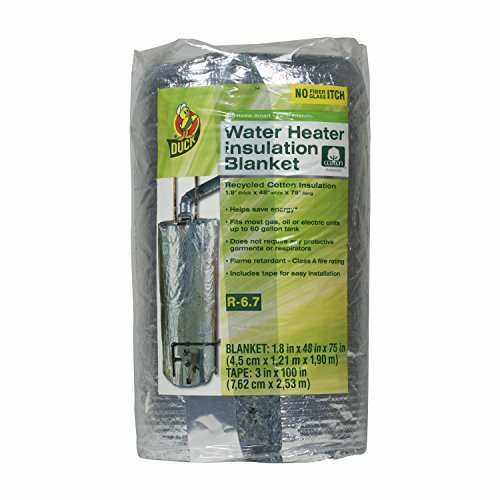 The Duck Brand water heater blanket measures 1.8”x 48“x 75”, and it features a non-irritating, fiberglass-free design, a weight of 6.3 pounds, a reflecting value of 6.7, and tape for easy installation. This heater blanket is also flame-retardant with a class A fire rating, and it’s suitable for oil, electric and gas tanks up to 60-gallons. A buyer mentions that since he installed this water tank blanket, he doesn’t run out of hot water anymore and that it works perfectly for a 40-gallon tank. He highly recommends it to anyone that wants to save energy. Another customer comments that he was surprised that there was enough aluminum tape to seal all the edges. He adds that it’s a piece of cake to wrap the blanket around the tank and cut the extra parts. A reviewer says that blanket really makes a difference and that he has used it for over two years with no problems. However, some customers have complained that the blanket doesn’t match the provided description and that it’s not long enough to wrap a 60-gallon tank. A user notes that the blanket couldn’t even fit around his 50-gallon heater, and he advises that you buy two. This insulation heater blanket offered by Thermwell is efficient, reliable and an excellent way to save energy. Users love the thickness of the blanket and the detailed instructions, but some do note that it doesn’t work as effectively as they expected. The Thermwell insulation blanket measures 1-1/2” x 48” x 75”, and it’s made of vinyl-backed fiberglass with a weight of 2.4 pounds. It’s suitable for gas, oil and electric water heaters up to 60-gallons, and it has a reflective value of 5. It reduces the heater’s recovery time, and the package includes a roll of plastic tape for installation. A reviewer states that the insulating blanket arrived quickly and that it was well-packed. The user adds that it’s easy to install it and that it really prevents heat loss. Another buyer shares that the Thermwell blanket is thick and well-made, but you should measure your tank carefully. He adds that his bill is now lower than before and that he is very pleased with the performance of the insulating heater blanket. Another purchaser says that he has been using the blanket for a month and that it’s holding pretty well. However, some customers have complained that the heater blanket doesn’t fit tanks up to 60-gallons and that it barely wraps a 40-gallon tank. Some also note that the quality of the material is cheap. The first water heater jacket we took a look at it is manufactured by Frost King- it measures 3.5" x 48" x 75" with a reflective value of 10. Buyers advise undecided purchasers and that this water heater blanket should only be used in a weather-protected area, which is to say not outside. One reviewer criticized its utility, saying that it was difficult to install and requires cutting so that it fits around outlets and other pipe fittings and is not a uniform thickness. Another homeowner says that he fit it on his 40-gallon gas hot water heater- he cautions novice installers that you shouldn't insulate the burner area of your hot water heater- you should only insulate areas where the water is in your water heater. To find that area, try to find the drain valve- it will be installed at the bottom of your water tank. This home rehab specialist advises that this is only intended for indoor use- once fiberglass gets wet it sacrifices all of its insulating properties. Other reviewers have been disappointed, saying that it didn't fully wrapp around their water heater, with some reviewers saying they had to pull it exceptionally tight to clear the circumference. However one homeowner says that it was able to fit a 50-gallon tank with an overlap- the problem seems to be that different buyers are receiving different products from the manufacturer- and for this reason we wouldn't advise purchasing it. The second water heater installation kit we examined it is manufactured by to fit up to 80-gallon water heaters. It is marketed as an energy-saving system capable of saving you up to 20% of your total water heating energy bill. Designed to be dynamic and adaptive, the manufacturers advertise that it can fit most styles of electric hot water heaters as well as gas and oil tanks, all the way up to 80 gallons. It ships with foil tape, the insulation as well as spacers and it is designed to be a hypo-allergenic option that is non-toxic for the throat, eyes, and skin. It's built from a closed cell foam and pure aluminum foil designed to enhance the performance of your insulation efforts. As with all of the options we examined, it is engineered to help you prevent heat loss from your home's hot water tank as well as boosting its response rate whenever cycling. Buyers we interviewed told us that both sides are covered in foil, that it is about a quarter of an inch thick, and that it fits different sizes as well, whether they be short and fat water heaters or taller cylindrical options. One homeowner says that installation was pretty simple- all he had to do was unroll the insulation, do some preliminary measurements to ensure that he could completely cover the circumference of his water heater, make some cuts and then slip it around his water heater. He did have to do some minor cutting, marking areas where his thermostats were so that he could create flaps for them to stick out through. Another buyer who was initially intimidated by the complexity of his water heater- it was sequestered in a remote corner of his basement, contains various jetting earthquake straps and pipe fittings to accommodate- was able to cut the insulation into three strips and tape them together around his water heater in a customized fashion. Another reviewer had a tricky insulation installation, having to accommodate a table top style water heater with a larger rectangular surface area- he was able to get it done in strips after some deliberative measurements and careful excisions. The third water heater insulation blanket we took a look at it is manufactured by M-D Building Products. It's designed to fit oil, gas and electric heaters that measure up to 60 gallons, providing 2-inch thick insulation at a value of R-6.7. This is a vinyl-backed fiberglass blanket. One homeowner told us that he was impressed by the quality of the included tape, the double layer of plastic and fiberglass sheet insulation and how small the shipping box was that that had it tightly rolled up in a small package. One mild criticism- a buyer told us that the plastic in a fiberglass is not actually bonded together, so unless you are careful during installation there is a risk they could separate. In general, however, most users found this to be a high-quality water heater cover that has done a solid job at decreasing home water bill and energy costs. Other reviewers even advised to try wrapping up pipes in foam to insulate them as well. 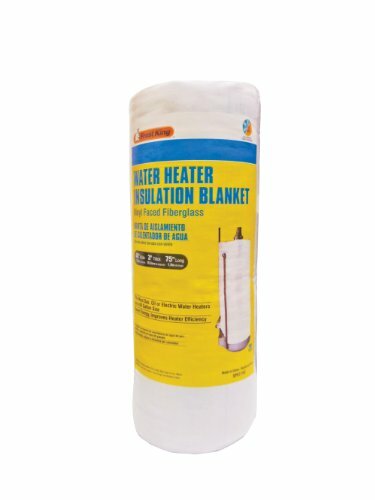 It's also advised to take careful measurements prior to purchase- one homeowner with a 50 gallon water heater says that even though this particular blanket says it covers up to 60 gallon circumference heaters he found that it didn't fully cover his- and so he had to purchase two, which wasn't a big deal. The fourth option we examined was the Duck Brand water heater insulation blanket. It is advertised as a 60-gallon tank option, built from recycled cotton insulation without any fiberglass, it also has a Class A fire rating. Duck Brand has a solid reputation for providing home weatherproofing products, emphasizing their designs as easy for novice home installers to do themselves. Particularly for older units, the heater insulation blanket is a highly regarded weatherization product design to save homeowners energy while reducing heat loss. Buyers say that it has been a solid water heater insulation blanket in addition to providing insulation to pipes prone to freezing during cold winter months. One user versed in thermodynamics tells us that this blanket is primarily designed to function as an air barrier, preventing air leakage, which is how it is able to contribute to cooling and heating cost savings. One buyer who owns a thermal leak detector told us he was able to verify the positive effects of the heater insulation blanket. Another reviewer said that it was a great fit on a 40-gallon tank- the way he was able to calculate prior to purchase was by multiplying the diameter of his unit by 3.14 and saying that if it is less than 75 then it will fit. Other reviewers said that the foil tape was effective, but in the end they had to supplement it because there just wasn't enough of it included. The last water heater blanket we examined is manufactured by Thermwell-and it measures 1.5" x 48" x 75" and is designed to fit tanks that are up to 60 gallons. This is a vinyl, fiberglass-backed insulation blanket ideal for electric, oil and gas heaters. 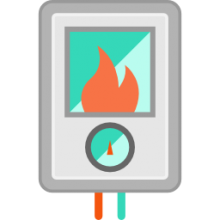 One reviewer had some important advice, saying that depending on the style of heater you have (gas, electric or water) you will have to do different modifications. For example, gas heaters actually have vents that you cannot block- which means it in his case he only insulated the top area of his water heater. Buyers were also impressed that their water got hotter in the shower. As other users have chimed in to mention, you might want to purchase white duct tape as a secondary supplement to the included tape that ships with this Thermwell water heater blanket.